In the olden days we played PC games about crossing the United States in a covered wagon. We faced down starvation, inclement weather, and watched digital simulacra of our friends and family drop dead of dysentery one by one. Times have changed, but indie devs The Men Who Wear Many Hats have brought us The Organ Trail : a modern update on the odyssey of yore. The dysentery is still there, but this time it's got zombies and motor vehicles. 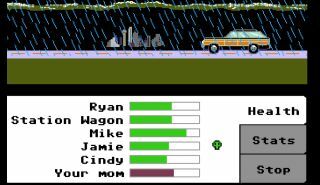 The Organ Trail Director's Cut, a for-retail upgrade of the original Flash version , challenges you to lead a party of hapless survivors across America in a station wagon, through the teeming hordes of the undead. Disease and starvation will hound you just as they did your pioneer forebears, but now you'll have to deal with running out of ammo and getting your body parts eaten while you're still alive. And if you happen to make it out of a fight with a walking corpse alive, you'll be infected, and left only with the option of being put out of your misery. The trailer above showcases the old school graphics and sound, "faithfully recreated it as if it were on the Apple 2." The PC version (a mobile app has been out for a little while now) is currently waiting to be Greenlit on Steam, but the devs are offering a free Steam key to anyone who buys it now, presuming it makes it through the approval process. You will be able to play the non-Steam version until then. Included in the Director's cut is an expansion featuring combat upgrades, more road events, and a "ridiculous physics based driving game." You can read more about everything you're getting for your $5 on the official site .